A lovely, light story of one sister, with interaction with her two other sisters. It's a story of returning home as a successful lawyer and choosing to remain and making a new life. Basically, it's a story of family support, loving and laughing, learning what counts in life. A very good read. I received a complimentary copy of this book as a part of a book tour for fair and honest review. 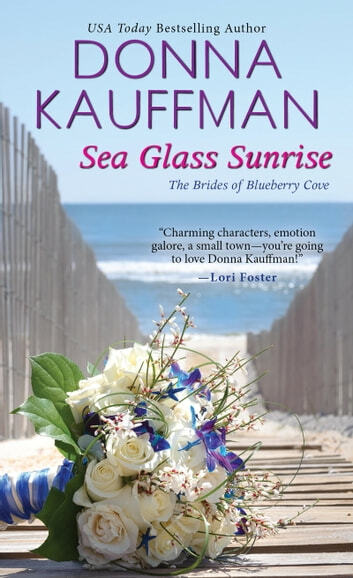 A light hearted contemporary romance, Sea Glass Sunrise by Donna Kauffman is the first book in the Brides of Blueberry Cove series, a spin-off from her Bachelors of Blueberry Cove series. Set in a small fictional town in Maine, Ms. Kauffman’s story is filled with colorful characters, family drama, a sizzling romance and a touch of comedy. While tied to another series, this is a book which can be read on its own. Returning to Blueberry Cove for her only brother’s wedding, Hanna McCrae plans to start her life over. Humiliated both personally and professionally by a romance which was a huge mistake, Hannah left her once promising career as an attorney in D.C. to return to the small town she once called home and is filled with people who love her. Only her first day back doesn’t exactly work out as planned, traffic accident caused by a new stop sign she wasn’t aware of, and soon she’s can’t remember why she wrote off hot men. Calder Blue has travelled to Blueberry Cove to conduct some business and settle a two hundred year old family feud. Becoming involved in a traffic accident with a pretty lady was not a part of his plans, though he’s definitely attracted to the woman. Will his temporary stay in Blueberry Cove turn into something permanent? Ms. Kauffman does a good job developing the characters of both Hannah and Calder, though I have to admit that I wasn’t a huge fan of Hannah at first (let’s just say she was foolish when it came to her previous romance). While both Hannah and Calder have romance issues from the past, they couldn’t help being attracted to each other from the start. It helped that they each found the other extremely attractive. I enjoyed watching their romance develop from what could have been a tragic incident and it helped that both characters had a good sense of humor and were decent people overall. The secondary characters were also well developed and I really enjoyed getting to know the people in Blueberry Cove. I especially liked Hannah’s family, her brother Logan, Alex McFarland, his fiancée/bride, and Hannah’ younger sister Fiona, who is a real hoot and has a wicked fashion sense. I also enjoyed getting to know Calder’s estranged family and Barbara Benson, one of the town’s police officers, who also happened to be the McCrae family’s substitute mom. Will Hannah and Calder give their blistering attraction a chance to develop into something more than a temporary romance? Will Calder be able to get his family to move on from their 200 year old feud? And will the town of Blueberry Cove be the home they are both looking for? You’ll have to read Sea Glass Sunrise to find out. I enjoyed it and can’t wait to read Snowflake Bay, the second book in the series featuring Fiona, which will be published in September. Awesome book! I love the books in this Blueberry Cove series and this is a great addition. Hannah McCrae is returning to Blueberry Cove after a huge scandal in DC has uprooted her well planned life. Calder Blue is in the Cove to find out why he is being offered a construction job even after he purposely overbid the job. When the two meet during a small traffic mishap there is an intense attraction but neither is looking for any kind of relationship. These two seem to keep running into each other in some hilarious situations. Throw in an age old family feud and some crazy town folk and you have one great story. I highly recommend this one. Kauffman has definitely done it again. This novel was a fantastic, approachable read with all the bells and whistles. The characters in this novel have the ‘awww’ happy kind of love. It’s fantastic. There is such unmistakable tenderness throughout. 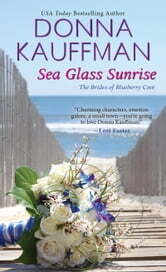 Readers also get to experience the Maine coast & small town life via Kaufmann’s picturesque writing. I’ll admit, at the beginning, even though I was enjoying the story, I was wondering exactly what direction it was heading in. By about 20% through, I couldn’t put the story down or get it out of my head. The well plotted and executed tale took me on twists and turns that one rarely sees in contemporary romance, but that really make the novel stand out. The McCrae sisters are a fantastic trio that I’m dying to get more of. The closeness of these sisters, and the way that they interact with one another was so genuine that I felt as if I were part of a family moment. The Blue family history added an extra twist to the tale that I loved unravelling. There were also lots of introspective moments that really draw you to the main characters as individuals. I loved getting a look at their feelings, fears, and desires, as well as how this all comes together to make these individuals who they are. I loved getting a look at how Hannah thinks and views things. The scattered, multiple thought trains at once was fantastic. I felt as if I really got to know the real her through it. Because of these intriguing two main characters I’ll never look at Gone With The Wind or Oliver Twist the same way again. These literarily inclined characters were definitely a treat. Kauffman never fails to leave me with a smile on my face at the end of a novel. This one was no exception. It’s a fantastic read for all those who enjoy contemporary romance. Please note that I received a complimentary copy of this work in exchange for an honest review.